Quarto Memoirs of The Bedfordshire Historical Record Society. Vol. II, Part IV. The Strip Map of Eversholt, 1764 with Notes on the Strip Map of Houghton Regis, 1732. by George Herbert Fowler (1936). Here is the whole map as a 4.8Mbyte jpeg. Click for the big picture. To download the image files, right-click the big image. These images seem now to be in the public domain, so you can do anything you want with them. Here is the same map in two halves, giving slightly better image quality. and even more! 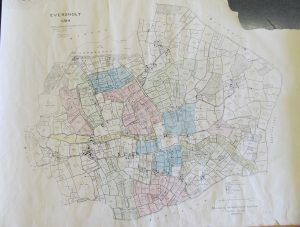 Fowler also published coloured maps showing the common fields and the major owners. Here they are, click for big versions. Here, for the search engines, is a text transcription of the Fowler paper. EJW OCRed the paper and fixed the typos by hand, so all the mistakes are his fault. Various liberties have been taken with punctuation and layout in this transcription, see the pdf above for the original version. However, the original uses many confusing abbreviations, expanded here, so this might be easier to read. The Fowler paper is part of a larger set apparently commissioned in a single volume analysis of village types in Bedfordshire. Fowler was asked to look at Eversholt, Houghton Regis and Seywell. In fact, he only looked in detail at Eversholt. The paper reproduced here does include information on Houghton Regis and Seywell as well, but that part of the paper is not relevant to Eversholt. Footnotes have yet to be added to this transcription. See the pdf for the footnotes, for the moment. Note. This essay is published simultaneously with the Map, for which it forms the explanatory text. The publication of this Part has been made possible by a generous contribution from His Grace the Duke of Bedford. § 55. The original map. § 56. Reproduction of the map. § 58. The peculiarity of Eversholt. § 59. The fragmented village. § 63. Use of the land in 1764. § 64. The Open Fields. § 69. The Endl and their names. § 70. Analysis of the proprietors. § 71. Resident and non-resident proprietors. § 73. Tenants and sub-tenants. § 74. The larger proprietors. § 75. The structural plan. § 77. Celtic settlements in Belgium and France. § 78. Celtic agriculture in England. § 80. The map and the township. § 81. Abstract of the manor of Houghton Regis. § 82. Notes on the foregoing abstract. § 83. Abstract of the Manor of Sewell. § 84. Notes on the foregoing abstract. The Bounds of the Mannor a Red dotted line. The Alphabetical Letters A to W and Red Numbers 1.2.3.4.5. etc. Refer to the Like Letters and Numbers in a Field-book to this Survey. The Field-book has fortunately been preserved; this is the more lucky, since the figures of the area of some parcels of land are illegible or uncertain, owing to parts of the map having been badly worn. It gives the surveyed area of each parcel, as well as the reputed area. Further it records the names of the owner and occupier of each parcel. On the whole, the map is in good condition, though faded; tested by proportional compasses against the six-inch ordnance map, it seems to have been drawn from a fairly accurate survey, and it is a good piece of draughtsmanship, though not of the finest. At a later date, but probably soon after the making of the map, the letters a and p were added to the parcels, to indicate arable and pasture; occasionally also such remarks as “Goss and Broom.” Though not part of the original record, this information was too valuable to be omitted. Apparently from the same hand and at the same time came a few corrections of acreage, and of the position of fences; the latter are reproduced as thin pecked lines. The map bears also a good deal of pencil marking, which seems to have been meant as instruction for the abolition of old boundaries and the creation of new field boundaries, doubtless drawn after the Enclosure Award of 1808; this pencilling naturally has not been reproduced, as being of a much later date. I believe a red line, which indicates the Park Wall of Woburn Park, to be also a later addition. Each parcel of land is marked with its area in acres roods and poles; it further carries a brown letter and red number. These letters and numbers bear no relation to ownership, and were apparently assigned simply for convenience of the survey and the Field-book. The parish being intersected by a network of roads and lanes, the principle seems to have been to assign a letter to a block of land which was isolated by road, brook, meadow, or parish boundary; and to add a number as far as possible in sequence on the perambulation of that block. The reproduction of the map is by photolithography from a tracing made by the present writer, reduced to half the size of the original. The scale is therefore about 13.3 inches to 1 mile, or 6 chains to 1 inch. Without being a facsimile, it presents as faithfully as possible all the facts recorded on the original map, but not the colours which denoted the different proprietors. The kind and size of the lettering used to mark the different features (Fields, Ends, etc.) have been carefully followed; but fine-drawn letters, pecked lines, etc., have necessarily been coarsened in order to admit of reproduction. Buildings were hatched and tinted on the original map, but are in solid black on the reproduction, in order that their distribution may be more conspicuous. The scale has been redrawn, as having become slightly distorted. A few words which I have added to the reproduction, such as ‘ Park Wall ‘ and ‘ Sand Pit,’ are enclosed in [crotchets]. The title, and the explanation of the colours have been omitted, but are printed in § 55. On the sides of the parish touched by Milton Brian and Woburn, some lands which lie in those parishes had been added by a later hand; these have been omitted from the reproduction, as being foreign to our subject. Where the parish boundary does not coincide with the edge of the mapped area, it is indicated by dots. (C) Herbert, a King’s reeve, held 2 virg. A. On the partition of the barony of Bedford among the three coheiresses of their brother Will. II de Beauchamp, Eversholt fell to Ela, the wife of Baldwin Wake, and at her death to her daughter Elizabeth or Isabella Wake. This lady married John de Horbury, but died without issue in 1314, her heirs being two great-nephews. There can be little doubt that Wakes End owes its name to the tenure of the manor by her and her father. This Beauchamp manor or part of it was tenanted in the 12th and 13th centuries by a family which was styled, either after their vill as ‘de Eversholt,’ or by a patronymic; members of this family, which also held the Beauchamp land at Milton Brian, made grants in both vills to Woburn Abbey, thus placing the Abbot as mesne lord between themselves and the overlord. By 1275/76 the abbot seems to have become the lord of the whole of this manor, and ultimately to have absorbed a small parcel of land given by the Eversholt family to Dunstable priory. The abbot at first paid yearly 2 marks to the overlord, but even this due was remitted by Elizabeth Wake in 1313, though the purely nominal overlordship was still claimed by the heirs of the Beauchamp barony in 1500. After the Dissolution, the manor became attached to the Honour of Ampthill, sold by the Crown in 1601, and eventually purchased by the Duke of Bedford in 1702. B. On the forfeiture of Bishop Odo, his lands escheated to the Crown, and were styled the Honour of Rochester where his castle stood. He had also 4 hides at Milton Brian the next village, and the two holdings are returned together, in 1242/43 as under Will. de Auberville who was then warden of the Honour; these Eversholt lands seem to have been feudally attached to Milton Brian and were still ranked as 2 hides in 1275/76. They probably lay next to Milton Brian; on the reasonable assumption that Wakes End represents the site of the Beauchamp manor-house, it seems possible that at Reddalls mansion at Brook End (the only other moated site), was the hall of the Bishop’s manor. The greater part of both holdings in Milton Brian was eventually acquired before 1428 by Woburn Abbey. This land also was purchased by the Duke in 1702. C. Such little holdings as that of the King’s reeve are interesting, but not easy to trace. They seem to have become neither manors nor parts of any manor in early medieval time, but were little holdings in chief from the King, who could resume them at the death of the tenant, and regrant them if he wished. When thus granted their dues were rendered directly to the Sheriff, who accounted for them on the Pipe Rolls under the rather miscellaneous heading of Escheats; when in the King’s hand, they are not entered on the Pipe Roll, but are included in the general Farm of the County; they therefore appear and disappear in a rather bewildering way. The 2 virgates at Eversholt are not shown on Pipe Rolls up to the end of John’s reign, and only two such rolls of Henry III have been printed as yet; in both of these, respectively of 1230 and 1242, the Sheriff accounts for 1 virgate at Eversholt. It had been conferred upon Will. of Leicester in 1205 at a rental of 4s., although reckoned in the Sheriff’s Farm at only 2s. ; it is returned also as held by a Will, de Leicester about 1275/76. No later trace of this land has been detected with certainty. D. A manor of doubtful authenticity, styled Wakes, appears in 1505; in the decadence of the feudal system, men sometimes arrogated manorial status for their land without due warrant; this may be an instance of the practice. E. Some difficulty is presented by the estate of the Rectory. In 1330 the rector claimed several such privileges as were only properly attached to true manors, stating that he and his predecessors had exercised these privileges from time immemorial by reason of a carucate of land which was the dower of the parish church. Though the King’s attorney raised some difficulties, the manorial status was not challenged, and the privileges were allowed to the rector on payment (as usual) of a fine. The advowson of the church lay with the Order of Knights of the Hospital of St. John Jerusalem, which presented the rector at least from 1228 until the Dissolution. Somewhat curiously, this church does not appear in the list of churches which were confirmed to the Hospitallers by King John in 1199; yet it is clear that it belonged to them as early as c. 1185, when it was included in a proposed bargain with the priory of Dunstable. Since there is no reference in their Cartulary to the original gift, one can only guess that the church was granted to the Hospitallers in the 12th century, and that its endowment was cut out of the lands of one of the two principal holdings. The rector could claim manorial rights under the general charters of privilege granted to the Hospitallers. If the suggestion made above be correct — that the Bishop’s land marched with Milton Brian, and that the two moated sites show roughly the sites of the halls of Beauchamp and the Bishop — then their relative positions seem to suggest that the church was founded by a holder of the Bishop’s manor. Whether a church was there before the Conquest or not, there is no evidence to show; the Bedfordshire Domesday Book hardly ever mentions rural churches, not even those which exhibit undoubtedly Saxon masonry. But the Great Inquest could hardly have overlooked the carucate of land with which the church was endowed; this was therefore probably given in the 12th cent. The earliest part of the fabric is stated to date from c. 1180. For the rector’s land in 1764, see § 74, h. The Rectory manor and advowson were bought by the Duke of Bedford in 1839. This cannot be expressed better than in the words of the late Professor Maitland. When discussing the general characters of English village structures, after sketching a nucleated village of the type now familiar to our readers from the foregoing pages, he continues – “On the other hand, we may easily find a country in which there are few villages of this character. The houses which lie within the boundary of the parish are scattered about in small clusters; here two or three, there three or four. These clusters often have names of their own, and it seems a mere chance that the name borne by one of them should be also the name of the whole parish or vill. We see no traces of very large fields. 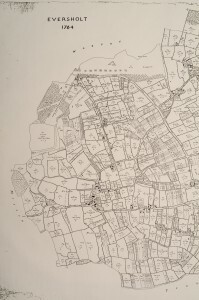 On the face of the map there is no reason why a particular group of cottages should be reckoned to belong to this parish rather than to the next. As our eyes grow accustomed to the work we may arrive at some extremely important conclusions such as those which Meitzen has suggested. The outlines of our nucleated villages may have been drawn for us by Germanic [that is, Anglo-Saxon or English] settlers, whereas in the land of hamlets and scattered steads old Celtic [that is, British] arrangements may never have been thoroughly effaced. Towards theories of this kind we are slowly winning our way.” Maitland illustrated his point by the reproduction of two small areas on the inch/mile Ordnance Survey; the one on the Oxfordshire-Berkshire boundary, “A Land of Villages”; the other on the Devon-Somerset boundary, “A Land of Hamlets.” Except for the fact that it has some fairly large Open Fields, Eversholt agrees well with the foregoing description. But it must not be forgotten that the absence of large Open Fields in western (Celtic) England may partlv be due to the nature of the country; much of it is hilly, often with steeply-sided valleys and combes, over large areas ill-adapted or impossible for extensive Open Fields; there is therefore a danger that we may be found to argue in a circle. (d) by the apparent presence at an early date of more numerous open fields than the three which are usually found in later Middle England. The chief aims of the present essay are therefore to discuss possible reasons for the lay-out of this fragmented village, and to challenge students of early agriculture to find and study similar cases in other counties for comparison. The area of the present parish—and there is no evidence that its boundaries have been appreciably altered — is returned now as 2146 acres. In Domesday Book it was reckoned as a 10 hide vill with land for ten teams (say 1200 acres), meadow for 9 teams (say 216 acres), and wood for 100 swine (say 200 acres). On the ordinary reckoning, this would leave something like 500 acres of waste for pasture, and marshy ground; these figures of course must not be pressed too closely. In so large a parish, distances apart are considerable; when read with a distance-meter on the original map, it appeared that from Wakes End by New England to Church End was 1.68 miles, and by Water End 1.8 miles; from Higher Berry End to Church End was 1.29 miles, and from Lower Rads End to Church End 1.02 miles. The area of nominal or reputed acres given in the Field-book is 2123 acres. In the inch-mile map of the Geological Survey, Eversholt is shown as on the Lower Greensand, and four sand-pits are marked in deep brown on the original map. But the large number of ponds, many of which are now filled up, seems to indicate that here, as elsewhere on the Greensand ridge, patches of undenuded Gault clay persist; the same story is told by disused brick-works shown on the 6 inch Ordnance Survey between Wits End and Rads End. This mixed soil is well adapted for timber, and much has been planted since 1764. The general slope of the ground is from west to east; the highest bench-mark on the 6 inch Ordnance Survey is 419.6 feet above sea level at Higher Berry End; Potter’s End stands at 383 feet; what seems to be the lowest point, at Little Clacks (Q 28) is about 280 feet. With so slight a fall it is natural that no water-mill is recorded here by Domesday Book. The brook is shown on the original map by parallel curving lines, but only at certain points. It begins about Newfound Well Close (E 74) and runs to Brook End connected with a large moat at Reddall’s house (F 16); along Brook End lane, through Holly Bush Close, and along the bottom of Ford Mead to Water End Green; from here onwards its course has been altered since 1764. It formerly ran just above the Doles in Fenn Mead, traversed the upper ends of the strips in Middle Mead, and ran above Clack Meadow and Turf Moor; it has since been diverted and straightened, parallel to its old course but further to the south and east, cutting across all the old meadows. Both old and new courses join at Little Clacks (Q 28) with another brook which comes down the north-eastern parish boundary, and with that ditch which has been identified as the Thing-rithe (Tingrith) or ‘brook of assembly’ along the south-eastern boundary. The limits of Paney Hill, Full Brook Furlong, etc., indicate a small brook which, in the lowering of the water level, has dwindled to a mere ditch, but found its way into the Thing-rithe. The coveting of meadow-land along a brook by the early settlers in adjacent villages seems to have led in very many cases to a compromise by which each settlement might hold the meadow on its own side, and the brook became the boundary of the township; thus brooks form the boundary of Eversholt against Ridgmont, Steppingley, Priestly (now ‘in’ Flitwick), and Tingrith parishes. It is much less common to find a valuable brook running through a township, and this may possibly be a symptom of small scattered settlements with a common interest, in contrast with the more usual compact township of Middle England expanding against its competing neighbours. Two moats are shown on the map; the one at Wakes End; the other, with one side elongated into a canal, at Reddall’s mansion in Brook End. An account of Reddall’s waterworks is quoted in the Victorian County History, which unfortunately infers that he lived at Wakes End. The Common or Waste has been almost wholly enclosed; there remain for grazing merely the verges of the highways, five Greens, and a tiny Common (Q 3) in the Old Field. 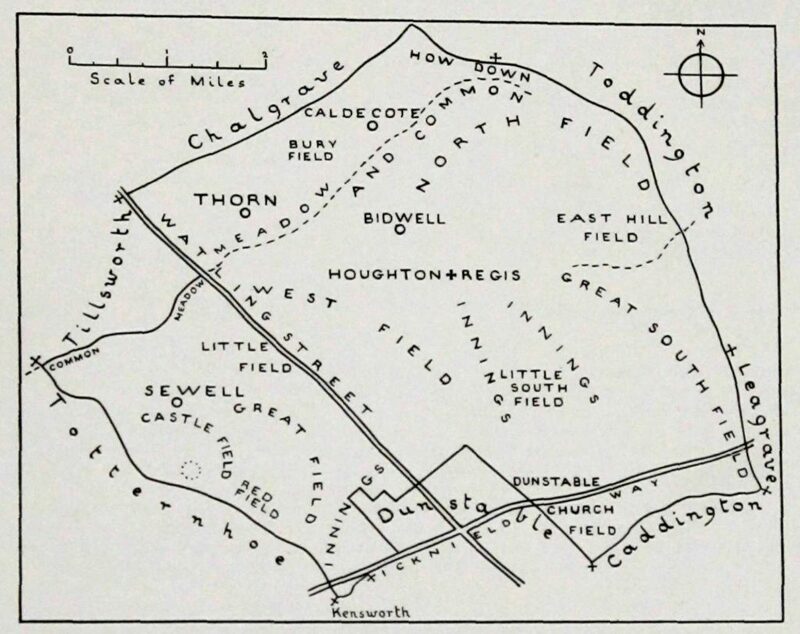 The most completely enclosed areas, which show little or no sign on the Map of having been arable, lie in the north and south, that is, near the supposed centres of the two Domesday Book holdings of Beauchamp and the Bishop. Between these two areas, but interrupted by the Meadow and the brook, the Open Fields stretch right across the middle of the vill; that they also had been much reduced bv enclosure, appears from a table in the Field Book. The Commonable Meadows are Ford Mead, Fen alias Pound Mead, Middle Mead, Clack Mead, and Turf Moor. The percentages have been added by the Editor. Open Fields were present, to the remarkable number of eleven, all but three of which are styled a ‘Common Field’ by either Field Book or Map or both. All but one of these were entered on the map in large lettering; in four cases by capital letters to distinguish between obsolete or obsolescent Fields, and the four which still maintained their ancient status and much of their ancient extent. They seem to have been laid out and extended in the manner usual for Anglo-Saxon Fields. After the Award by a Parliamentary Enclosure Commission which usually allotted land in largeish blocks, little detail of the original arrangement of the Fields which they obliterated can usually be seen. But a piece-meal and individual enclosure, such as had largely affected Eversholt before 1764, is more informative. A man could only enclose from the Open Fields (if the other commoners did not object) so many adjacent strips as he or his forbears had been able to bring side by side through marriage purchase exchange etc. The documents of Eversholt available at the County Record Office only begin in 1527, but record that such enclosure was proceeding rather actively in the 17th and 18th centuries. A close thus taken in from an Open Field often shows its origin by its shape (long and narrow), its length (more or less a furlong), the [S or (] curvature of its sides (N 34, N 35), its ‘stepped’ ends (N 22/23, N 30/31), its alignment with neighbouring arable strips which have escaped enclosure (N 27, N 34, N 35), or its actual retention of a few unaffected strips (T 19 to T 21, T 53 to T 56). An attempt has therefore been made to reconstruct an earlier extension of the Open Field from evidence of this kind, supplemented by the Field Book, by names on the Map, by documents in the County Record Office, etc. The result is shown in fig. 5 (at the end); but it seems likely that at some date these Fields may have been even larger than is there shown. Copmore Field presents few signs of its former use. It is mentioned in a deed of 1601 and as late as 1737, but not by the Map or Field Book. Yet seven strips are still to be found in it on the Map; some ‘stepped’ hedges (T 16/22, T 21/25, T n/10) are an almost certain sign of the ends of old Furlongs; and numerous ‘Copmore Closes’ help to gauge its former extent. The enclosure of part of this Field by Richard Reddall in the early 18th century is on record. Old Field is a puzzling relic; nearly eight of its few acres (Q 3) are the only patch of Common left in the parish. The adjacent name Kingshoe, which occurs as early as 1547, suggests that here perhaps may have been the land of the King already mentioned (§ 57C, and § 74 m). Water End Field probably extended yet further to the north-east, but has been almost enclosed out of existence. 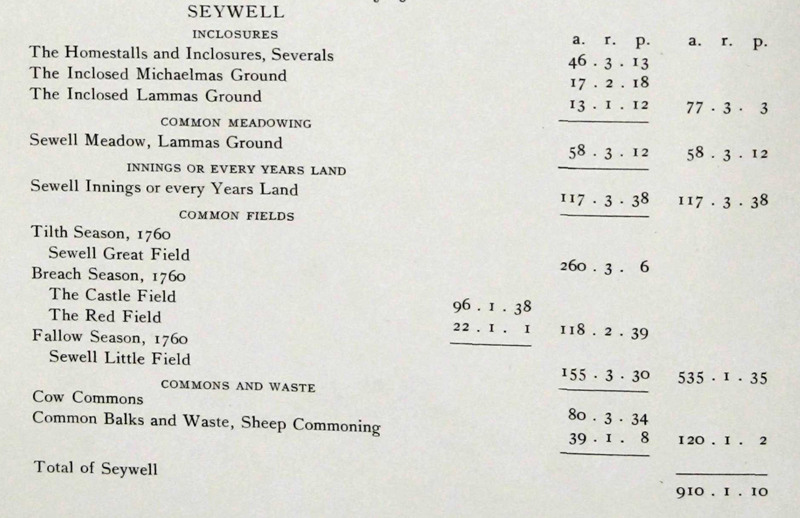 Bean Mead Field is named as a ‘Common Field’ in the Field Book, but few strips remained in 1764. It may have reached further to the west. Green Hill Common Field is clear enough at its western end, but for its eastern extension the evidence is rather weak. West Common Field had been largely enclosed. A document of 1737 records the enclosure by Ambrose Reddall (d. 1731) and his son Richard (d. 1757) of between 40 and 50 acres in this Field, including Long Down (E 65). The names of several of its component parts had disappeared bv 1764: — Tivington Close, Woodstock Furlong. Rush Slade, Rossmore [ ? later Redmoore], Roundlow Furlong, Yrching or Urching Mead, Trowlesmore Furlong, are all found in the earlv 17th century. Mill Field was known as Echlow Field in the 18th century. Manshead Common Field contained the moot hill of Manshead Hundred near the brook. There is unfortunately no evidence to show whether the eleven Fields were merely extensions of arable into the Waste, to meet the needs of a growing population (which seems to be the usual reason for multiple Fields) or whether each was laid out by and for the use of a particular End or Ends. It is a far cry from Berry End to Mill Field, or from Froxfield to Lechmore Field. No record has been found to show whether they were linked in Seasons. The Meadow was, as always when possible, laid out along the brook. Every parcel which is named as Mead or Meadow lies along the main brook; except Butlers Meadow and Park Mead (R 21, R 22) on the brook which forms the north-eastern boundary of the parish, with Turf Meadow (S 20) on a ditch tributary to that brook; and except Mead Stocking (H 14) which, with the Fatten Grounds (H 21, H 22), appears to lie on a big ditch. Some of the meadow is enclosed and in ‘several’ ownership, but Ford Mead, Fenn Mead, Middle Mead, Clack Meadow, and Turf Moor, are held in strips of varying width by different people, and are styled in the Field Book as “Common Meadow,” that is, commonable after hay harvest. Ford Meadow seemed to offer a good opportunity for testing the nominal or reputed acreage of meadow against the actual or surveyed acreage. The surveyed area of strips G 63 to G 81, when summed, tallied accurately with the measurement of the same area as drawn on the map. But the sum of the nominal areas of these holdings was about three times the actual acreage, and shows once again that the nominal acreage of pre-enclosure agriculture may be extremely misleading. In this case the reason is not hard to find; it lies in what has been already mentioned (p. 25, col. 2, above) – that these reputed ‘acres’ were so styled from their width, not from their area. The idea of an acre being 66 ft. in width was transferred from the arable strip, of more or less a furlong in length, to the meadow strip of very variable length. This is easily tested on a group of fairly regular strips ; for example, the combined width of G 63 to G 67 measures 2 chains 1 rod on the map, that is, 148.5 ft. ; the sum of their reputed acreages in the Field Book is 2 acres 1 rood, of which the width is (2 x 66)+16½ ft. = 148.5 ft. Again, strips G 82 to G 85 have a total width of 1 chain 2 rods measured on the map, and a reputed acreage of 1 acre 2 roods, or 98 ft. in both cases. If the meadow strips were furlongs of 220 yds. in length, the reputed acreage would be correct, but the mean length of those tested is only about 82 yds. ; hence the discrepancy between reputed and actual acres. The point is shown from another angle in a ‘bargain and sale’ of land in 1602 ; by this were conveyed “three Roodes of Meadowe wantinge three foote.” which are described as three parcels of 10½ ft.. 24 ft., and 10½ ft.; total 45 ft. ; on adding the 3 ft. ” wantinge,” we get 48 ft., that is, the width of “three Roodes” measured by the obsolete but once common rod or perch of 16 ft. And it is clear that the draughtsman of the document was thinking of “Roodes” by their width, and not by their area. Of the 80 holdings in these five meadows of which the reputed area is given in the Field Book, the commonest is a half acre (28 cases), the next commonest a rood (25 cases). If the half acre had been the original allotment, the roods ought to have been produced by halving the half acre, and to occur in pairs; in fact they generally occur singly between two half acres. But in the solitary cases of a “swaith or half rood” (G 77, G 78), the two lie alongside of one another, and seem clearly to be one rood halved. It is therefore probable that the original strips were of one reputed rood of 33 ft. width, and that, in the course of centuries, adjacent rood-strips often passed into one ownership; the holding was as much as 3 acres in one case. Figure 1. Fenn Mead and the Doles. The Doles of meadow are of some interest (O 35 to O 36). The present writer has already suggested that such doles, for which lots were originally drawn yearly, represent land taken into use after an earlier general allotment had been made, (perhaps centuries after). In this case it certainly looks as if Fen Mead (O 5 to O 33) had been meadow land of the original allotment; and as if, on the shrinkage of the brook by the general reduction of the water level, the new meadow which thus became available was made a communal meadow in fairness to the community. It is to be noticed that the individual doles are neither aligned nor continuous with the strips in Fen Mead, physically or in ownership. Apparently, by 1764 they had already passed into several ownership. The reputed size of these Doles seems also to have been measured by width and not by area. The first (O 34) is entered as “2 poles in length of 14 feet each pole”; the remainder as any number from 1 to 11 “do”. There are 98 reputed poles, which at 14 ft. per pole yield 1372 ft.; the total length of the doles, as measured on the tracing along the brook, is about 1428 ft; the 56 ft. excess (4%) may be assigned to the error of my tracing and to rough measurement. The Common or Waste land had disappeared, except for 7a. 3r. 20p. (Q 3) marked to “the Cottagers” both in 1764 and 1795. There were also Greens at Water End, Kettle End, Hunts End, and Potters End, amounting to 5a. 1r. 11p. The total area of lanes and highways was returned as 34a. 1r. 10p. ; the verges of these could probably be grazed as usual, yielding a little more common pasture. The Woodland was recorded in Domesday Book as enough for 150 swine; according to the editor’s computation this would be something like 200 acres at least. With the extension of cultivation, this area would naturally be reduced, but has left traces in the lost Woodstock Furlong in West Field, and in the field-names of the ‘Stockings’ (H 13, 14; S 5, 6, 7, 8, 12) from which wood has been cleared. The Field Book returns only 95 acres in 1764; much has been planted since. It is probable that Birchall Wood (S 43) is the ‘grava Burchard’ mentioned about 1220 in a grant of land at Eversholt. No certain trace is left of the two demesnes which are recorded in Domesday Book, though each of them could carry two teams of oxen at that date. 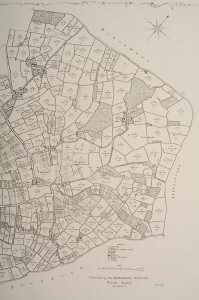 The abbot of Woburn was already lord of the Beauchamp manor in 1275/76, and no record as yet shows whether the demesne was used to provide food for the abbey, or was leased to free tenants. While resident squires generally kept their demesne together or even increased it, it was often broken up by sale or by very long leases under non-residents. After the Dissolution, the manor of Eversholt was held by the Crown or its lessee for some 64 years, and then sold to Henry Astrey of Harlingdon; it soon passed to the family Hillersdon of Elstow, and from them to the Duke; all were non-resident, and the obscuration of the demesne is therefore natural. But it is at least probable that much of the compact holdings of Robert Parker and Ambrose Reddall in 1764, shown in figure 5 (at end of this essay) is based on the demesnes of the two Domesday manors (§ 57) of Beauchamp and the Bishop respectively. Their homesteads are moated; and though moats are mainly of medieval date, they usually indicate the site of a house of considerable importance and antiquity. § 69. The Ends and their names. If it be asked – how far are the seventeen Ends genuinely early settlements – the answer can only be based on inference. The complex network of roads which connects them is almost certainly an ancient feature; rights of way (except perhaps over the Waste) were strictly defined in medieval time and jealously restricted, and it is almost unthinkable that a man should at any date have been allowed to break a road to a new homestead across existing fields and pastures; though the converse, the extension of a Field across what seems to be an old track, is not uncommon. Unfortunately these Ends, not being manors, were so unimportant as rarely to be mentioned in the kind of documents which have been preserved, until the more plentiful records of the 18th century are reached. It is however clear that many carried their present names at least one or two centuries before 1764. 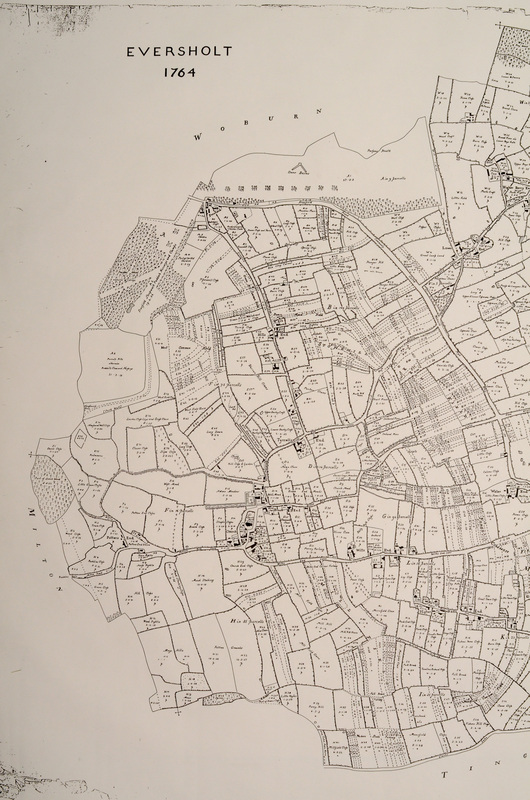 The number of dwelling-houses shown under each End is drawn from the Field Book. 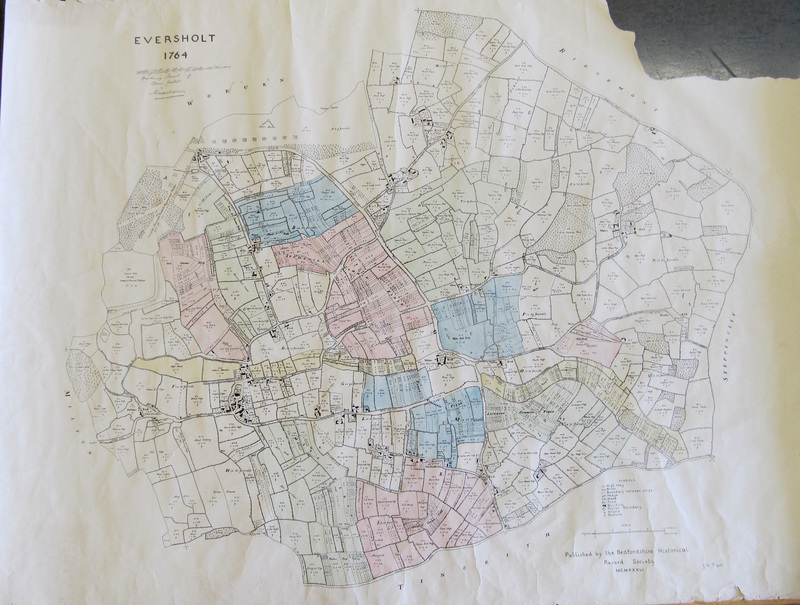 While Church End was slightly the largest, it contained only 14% of the total number of houses. If we consider their names in the hope of some clue to the antiquity of the Ends, we may at once dismiss five as valueless for the quest; Brook, Church, Hills, Potters, and Water Ends may have received their names at any period. Berry End, more correctly Bury End, as including the highest point in the village, is referable to the Old-English (Saxon) word ‘beorg,’ a hill. Froxfield is pure Old-English, ‘forsc feld,’ the frog field. Though fairly common as personal names, it is at least a curious coincidence, and may be a good deal more, that among those who paid at Eversholt to the Subsidy of 1309 were William and Walter le Hunte, Alan le Ketil, Robert Tyrel, Joan Juliana and Ralf le Withe (Wythe), from whose families Hunts End, Kettle End, Tyrrells End, and Wits End may have drawn name. New England, known elsewhere as the name of a hamlet, is possibly a corruption of New Inland, land added newly to the demesne; this of course is a mere guess, though Inland was used in this sense from the 10th to at least the 18th century. Bearing in mind that the two Rads Ends lie close to the hillock which has been suggested as the meeting hill of Manshead Hundred, it is at least possible that they drew name from the Old English ‘raed,’ meaning council or counsel; but it must be added that Professor Mawer, who was kind enough to consider the point, is ‘very doubtful’ of this derivation. The change from Radesho to the modern Rads End is paralleled by the 18th century Salpho becoming modern Salph End, and Bolnho becoming modern Bone End and even Bourne End. Wakes End carries us back to the ending of the Wake tenure (§ 57) of the manor in 1314. It appears therefore that at least two names take us back to Saxon time, and (probably) five to at least the 14th c, but that none can be claimed as British (Celtic). A great and probably significant, difference between Eversholt and the three villages discussed in the previous pages, lies in the number of proprietors of land. Oakley (1786 acres) in 1795 showed about 15, Renhold (2211 acres) in 1781 about 10, land holders. 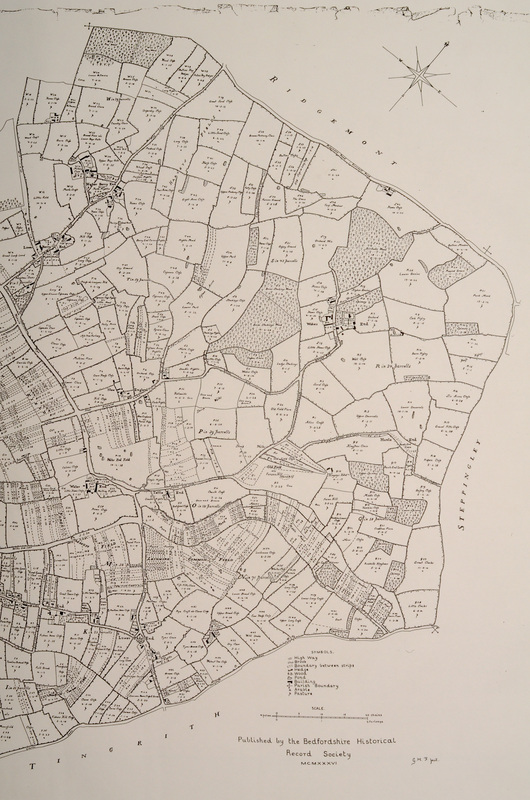 Aspley Guise (1899 acres) about 1745 had 47 holders of land, but it is not possible in this case to separate with certainty proprietors from leasehold tenants. 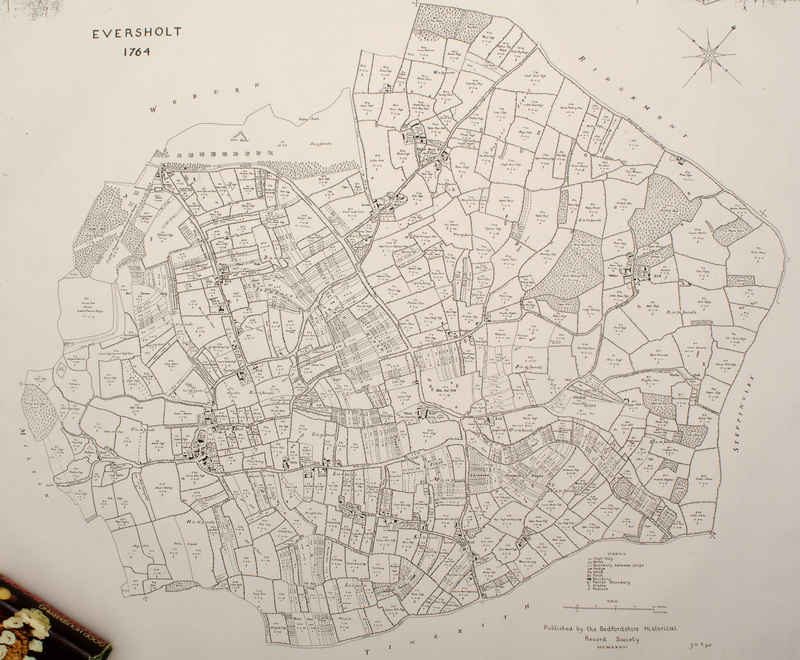 Eversholt (2146 acres) on the other hand had 70 proprietors, and 64 tenants who were not proprietors, clearly a social fabric of a much more medieval sort than the other three villages presented. No distinction is made by the map or the Field Book between freeholders and copyholders; apparently both were included under proprietors. At this point a word may be said of the legal status of these proprietors. The Duke of Bedford had acquired the manorial rights of Eversholt in 1702. But these rights did not carry ‘ownership’ of all the land there, nor indeed of any of it necessarily; there were the freeholders and copyholders, who in one sense ‘owned’ their lands; their tenure was saleable and heritable, and unchallengeable so long as the manor received its dues. These men however had not a ‘freehold’ in the modern sense of that word; they held their land subject to a yearly payment (amongst other things) to the lord of the manor, which in many cases had been fixed centuries ago, and bore little relation to the real annual value of the land. In the deeds which they executed, most of the larger men are styled yeomen, the lesser husbandmen, the smallest labourers. Nine of the larger proprietors are specifically named (§ 55) in a table on the original map; two more have been added in the table below, so as to include all proprietors of more than 50 ac. The percentages there shown are calculated on the total area, exclusive of roads and waste. The last column shows the End at which lay the more compact part of a man’s estate (disregarding scattered enclosures, and strips in the Open Fields), and the numbered letter of the house in which he probably lived and from which he or his tenant farmed. Duke of Bedford 609 0 6 29.33 Froxfield, Water E. (G 60), Tattle E., Wakes E.
Robert Parker 105 3 3 5.05 Wakes End (R 16). Gregory Cook 107 1 28 5.15 Church End (G 14). Susan Symons 90 3 7 4.33 Witts End (L 2). these last having usually only a cottage and garden. Among the lesser men, owners or tenants, were two blacksmiths, one carpenter, one shoemaker. A liberal supply of seven ale-houses had the names of the Roebuck, the Last, the Red Lyon, the Go further and fare worse, the Six Bells, the Falcon, and the Boot. It has thus become possible to consider how many of the 26 residents who held less than 40 acres may be described strictly as small-holders — a class of which I have not yet met a satisfactory definition; if one existed, it would be difficult to apply, because men often had sources of income additional to their mere holding. Examining first the eight who held between 5 and 40 acres, S W held about 33 acres, and would be better described as a husbandman; J.P. held nearly 19 acres, which he shared with 3 tenants; F C held just over 13 acres, kept about 7 acres in hand and let 3 houses, of which one was an ale-house and another a shoe-maker’s shop; M M held and used about 8 acres, but leased more than 53 acres; T D held 10½ acres, and leased 59 acres. ; W.C. held 5 acres, and leased 157 acres; E.P., with 7½ acres, let all the land to 3 tenants but kept his ale-house; R.P., with 9½ acres, leased another 22½ acres; these at least are hardly the small-holders over whose loss of pasture for a cow under Enclosure so much sympathetic ink has been spilt. Taking next the 18 who held less than 5 acres, – we can eliminate J.Y., who held only 2½ acres but leased nearly 67 acres, and J.G., son of one of the larger proprietors. To four persons who kept five ale-houses, and to a blacksmith a little bit of land was probably a supplement rather than a livelihood. There remain E.J. with 3 acres; F.M. with 1¾ acres, who leased another 11¾ acres; T.D. with 1¼ acres who leased 4¼ acres; B.B. holding 1¼ acres, and leasing another ½ acre. Seven held only a few poles on which were generally a cottage and garden; these may be classed as labourers. There seem therefore, so far as may be judged from the record, to have been four small-holders and six labourers who were resident proprietors. As only 7 acres of Common remained to be enclosed, the sole loss which they would suffer under a Parliamentary Enclosure would be common of pasture in the Open Fields after harvest and on fallow, and on the Common Meadows after hay was carried — always supposing that their tenements carried the right of commoning. Once again it seems that, by the date of the Parliamentary Enclosures at the end of the 18th century, the small-holder had almost disappeared in this part of England. § 73 Tenants and sub-tenants. the last being usually a cottage and garden. The total land held on lease was approximately 1555 acres including houses, farmsteads, cottages, gardens, and such like. 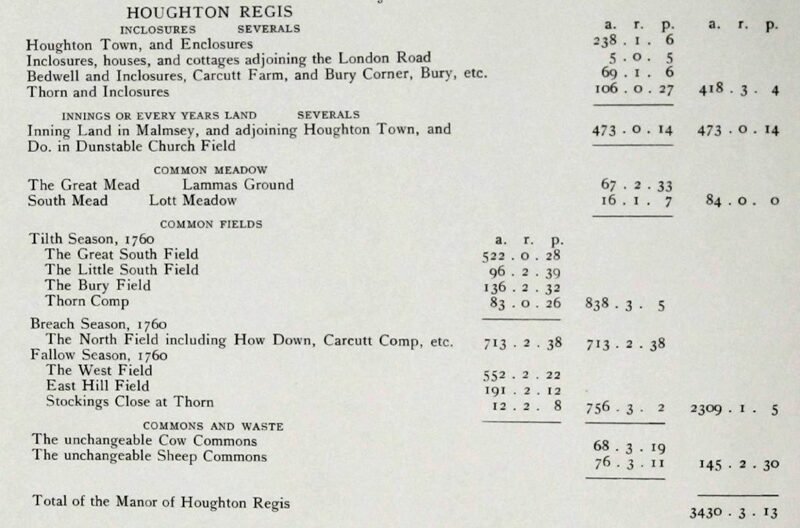 This high figure of leasehold, about 73%, is largely due to the non-resident proprietors, who let about 932 acres; further the Feoffees of the Charity and the Rector both let their land, another 173 acres; four of the big proprietors kept some in hand and let the rest. § 74 The larger proprietors. Their acreage has been shown by the table in § 69. In figure 5 (at end) are represented by dots and dashes the Open Fields in their (supposedly) greater extent at some former date (§ 64), and the Meadow land; the roads are drawn in heavy black. The compact portions of the chief freeholds (omitting outlying closes) have been super-printed in red, with the name of the freeholder, and the letter and number of the principal farmstead if any. a. Duke of Bedford, no. 1 (Froxfield). This area probably represents an original estate of Woburn Abbey, since it marches with that parish. The greater part had been enclosed in Woburn Park before 1764. There is no farmstead. b. Duke of Bedford, no. 2 (New England, T 1). This seems to have been cut out of Copmore Field, and has been suggested (§ 68) to be a New Inland 40.
d Duke of Bedford, no. 4 (Tattle End) There is only a cottage here. e. Duke of Bedford, no. 5 (Wakes End, S 14) This may well represent a part of the demesne of the Beauchamp manor, sold off from the rest. f. Ambrose Reddall, no. 1 (Brook End, F 16) The holding is probably based on the demesne of the Bishop’s manor. It is known to have been considerably enlarged by enclosure from Open Fields in the 18th century. g. Ambrose Reddall, no. 2 (Higher Berry End, T 33). Probably an early property, but known to have been enlarged by enclosure from Copmore Field in the 18th cent. h. The Rector (Hills End, E 54). This compact property can hardly have been an original endowment of the church, because it seems to have been cut out of Green Hill Field; but no record of its origin has been found. The glebe also includes a good many strips in the Fields and a few in the Meadows, three closes, and a wood. i. William Whitbread (Tyrrells End, D 1). What may have been a small early holding seems to have been enlarged at the expense of Green Hill Field. j. Susanna Symons or Symonds (Witts End, L 2). Apparently an early holding. k. John Gregory, no. 1 (Higher Rads End, K 9). Probably an early holding, but the lower eastern part looks as if cut out of Manshead Field. l. John Gregory, no. 2 (Higher Berry End, W 36). The lie of the holding suggests that at some time it has been cut off from the larger estate here (Ambrose Reddall, no. 2). m. Robert Parker (Wakes End, R 6). There can be little doubt that this is the centre of the Beauchamp demesne, including the moated site which probably represents the manor house. p. Gregory Cook (Church End, G 14) was proprietor of 107 acres , but they were scattered and appear to have been chiefly enclosures from Open Fields. The holding seems to be a composite, with no claim to antiquity. q. Of Gregory’s Assignees in Bankruptcy nothing has found beyond the record of their holding, which was a compact block of pasture land in the south-east corner of the parish (H 15 to 23). without a farmstead. There is no evidence to show that John Gregory of Rads End and Berry End is the man concerned. b. Was it the result of more or less deliberate planning? and, if so, by Roman. English, Scandinavian, or British settlers? d. by grants or leases of blocks of land in waste or demesne? ii. Was it derived from a non-nucleate type of settlement? I. It is possible that the lay-out was a spontaneous and original growth. (a) It seems however fairly certain that it was not prompted by natural features. There is nothing to show that either marsh or forest were dominant at any time; the contours are regular, and the whole area slopes very gently. There seems to be no great variety in the soil. (i). If so, its derivation from a nucleated village of English type first claims our notice. (a) It seems to be unlikely that the compact little properties round the larger farmsteads could be produced by aggregation, by the purchase of small parcels of cultivated land. Certainly there was a free market in freehold land during medieval time; but the countless little land-charters seem to show that the land generally passed in tiny parcels, and only a few roods or acres changed hands by any transaction. A long persistent effort would be needed to build up a compact estate of even 50 acres by purchase and exchange. And if this could be done at Eversholt, why not elsewhere? An unpublished roll, for the knowledge of which I have to thank Miss Joan Wake, records the gradual acquisition of 130 acres of arable and 7 acres of meadow at Turvey, apparently towards 1280; this was achieved by about 148 separate transactions, most of which conveyed only two or three selions, the largest 4 acres; the resulting estate was clearly dispersed in the Open Fields, not compact. This method of aggregation of strips however accounts for late additions to an estate at the expense of the Open Fields, such as the Reddalls made (§ 64) in the 18th century. (b). The isolation of the farmsteads, each surrounded by land which it uses, is of course to be seen in plenty of villages in Middle England, as they became after the Parliamentary Enclosures of the 18th and 19th centuries, when the allotment of land in large blocks made it both possible and advisable that the farmer should live on his farm. But it is rare to find a single house outside the nucleus before Enclosure, except where more than one true manor was to be found in the township. If Eversholt be supposed to have been originally a typical nucleated village, then it is of course possible — almost anything is ‘possible’ in such matters — that its wise men had forestalled by some centuries the drastic agricultural revolution of Enclosure, and had abandoned their homes in the (supposed) nucleus, to build themselves scattered farmsteads more or less remote from the Open Fields from which they drew their daily bread. If this were so, it would be indeed remarkable that they left the Open Fields almost unaffected, and confined their innovation to the waste or common; it would also be remarkable that the wise men of no other village in this part of England (so far as I can learn) should have shown the same enterprise. The likelihood of such a precocious Enclosure by agreement seems to be small. (c). Still less is it likely that individual men cut holdings for themselves out of the waste, and enclosed them. Private enclosure was very definitely restricted at all dates; the lord could presumably enclose any or all of his private demesne, since there seems to be no evidence that the villagers had right of common over it; but in medieval time and for long afterwards, enclosure by lord in the Waste or by freeholder in the Open Field was only legally possible with the consent (at least tacit) of the commoners whose grazing area would be thereby reduced; even in the 18th century unauthorised enclosure was strongly opposed. Enclosure of aggregated strips in the Open Fields, has been mentioned; but a freeholder could only enclose a block of land in the Waste if he or his predecessors had received a grant or lease of it from the lord. (d). Such grants with permission to enclose were lawful and not uncommon, provided that the commoners were not thereby prejudiced; and it is possible that this may account for some of these little compact properties, whereon the grantee built him a farmstead and created an End. The same result might follow on a very long lease; and it appears that Henry Astrey of Harlington, when lord of Eversholt manor, gave leases for 1000 years here in 1598 and 1601, but these were only of small parcels. Both grant and long lease fail (like everything else) to explain the absence of the nucleated village, and the lack of parallel development in other townships. Further, the early date at which some Ends are found would seem to place such grants and leases in a period when their appearance (except as gifts to religious orders) would be unlikely. But they do offer a more satisfying explanation than any of those discussed above. (ii) If the structural plan has not been developed from a nucleated settlement of English type, we have still to ask whether it can have been modified from some other plan, perhaps derived from some culture other than English. § 76 Meitzen’s types of Teutonic and Celtic settlement. The only possible culture left seems to be that of the Celtic peoples, whom the earlier geographers record as inhabitants of this island; some consideration therefore must be given to these folk, and to their settlements in other lands. Unfortunately, to discuss Celtic peoples is to kick over an archaeological bee-hive, with the certainty of being stung. Somewhere about 700 or 600 BC came to England a folk generally called Cymri or Brythons, an early swarming of those Celtic or Gaulish peoples who covered almost the whole of France at the date of Caesar’s Gallic wars. Of these peoples another branch, the Belgae, occupied the lands between the rivers Rhine and Seine; some of these crossed to England as a later Celtic swarm, probably in the first century before Christ. The Celts were everywhere pressed to the westward by the advance of Teutonic tribes at the great Folk-wandering of the 5th century AD, — by Angles and Saxons in England, by Franks Burgundians and Goths in France. It is therefore to the west that we must now look for light on their settlements, though something may be learnt from their earlier homes before their conquest or displacement by the advancing Teutons. In the first instance, we turn naturally to the classic volumes of August Meitzen. That in so monumental a work, some general conclusions should prove to have been too sweeping, that even some statements of what seemed to him to be fact should be found later to have been inadequately based, will surprise no one who considers the immense field of observation and record which that author surveyed. Of late years several attacks have been made on parts of his work, as the outcome of local knowledge of detail, and of more recent studies; but his main positions seem, at least to the present writer, to be unshaken. In the area which covers roughly Schleswig, Holstein, Hannover east of the Weser river, Saxony, Thürinngen, and down to the river Main, — an area which was the home of the Teutonic tribes as far back as history reaches, and from the northern part of which Angles Saxons and Jutes are generally admitted to have sailed for settlement in England — throughout this area Meitzen describes a village type which corresponds closely with our nucleated villages (the ‘Haufendorf’), a type of settlement with three fields, and three-course cultivation in strips. But in Hannover west of the Weser river, through the greater part of Belgium and Holland, and in Westphalia, territories which were occupied by the Menapii, Belgae, and other Celtic tribes (swamped later by Teutonic swarms), a totally different type of settlement is found, that of single homesteads (‘Einzelhofe’). Again in the more purely Celtic or Gaulish parts of France, those which were not so completely overwhelmed by the Teutonic Franks and Burgundians, the single-homestead type is almost universally found. According to our author, a peculiarity of these scattered homesteads is that each is usually surrounded by lands which belong to it, and they lie in small enclosures, generally shut off by hedge or ditch. To Meitzen, the dominant motive which produced these two types was ethnic, the Haufendorf or nuclear village being Teutonic, the Einzelhofe or single homesteads being Celtic. The Catuvellauni, the British tribe in whose territory Bedfordshire seems to have lain, is believed (and denied) to have been a branch of the Belgae, and an offshoot from the Catalauni who settled on the river Marne and left their name on Chalons. 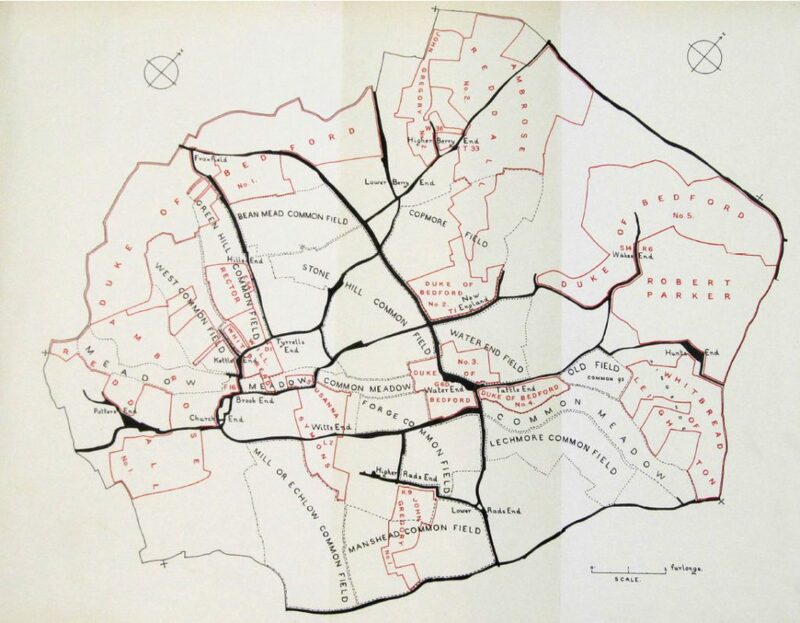 The settlement of Lower Belgium has been discussed by des Marez ; he finds the single-homestead type with small enclosures still prevalent in the 19th century in the province of Antwerp and in the southern part of Flanders; that is, in the area where the Belgae were conquered by the Salii, a tribe of the Franks. He pictures them as pastoral and almost ignorant of agriculture, as installing themselves in the farms of the Romano-Belgae, and as continuing the methods of cultivation which they found in use. He denies (without offering evidence) that each homestead was surrounded by more than a little of the land which belonged to it (as the Salii had arrived some 1500 years previously, this would not be surprising), and he refuses to admit that the single-homestead type has any ethnic value. The Franks gradually spread into France; in 486 they finally established their rule over north-eastern France, and by 568 they were military masters of practically the whole country. Naturally, the extent to which they stamped their customs on any particular area was not uniform, and probably depended upon the closeness of their settlement and its distance from the Rhine over which they had poured. In a valuable study of France’s agricultural history, M. Marc Bloch finds four systems to be, or to have been, in use. (1) Periodic cropping, by taking crops for a few years from moorland, then allowing it to revert to the wild and ploughing a fresh area. This seems to have been the earliest form of European agriculture (Meitzen’s Feldgraswirthschaft), and was still in use in quite recent times in parts of England (Devon and Cornwall, for example) and Scotland (‘outfield cropping’). In France it is found in Brittany, and on all the mountainous frontiers. (2). Two or three large Open Fields, with a system of cultivation almost identical with that of Middle England; the familiar features of subdivision of the Fields (quartiers. quarentenae), of a rotation with fallow, of strips and selions, of common of pasture after harvest, are all present. The villages are usually nuclear. When the provinces to which the author assigns this type are plotted on a map (which he does not supply), they cover the whole north eastern part of France (except the Pays de Caux), the part earliest and probably most completely settled by the Franks. (3) Open fields, small, irregular in shape, in several ownership but subject to common of pasture after harvest. This type is usual over south-western and south-eastern France and in the Pays de Caux, but has not been noticed in England and need not detain us. (4) Enclosures, small, of irregular form, sometimes walled but usually surrounded by hedges or banks ; they are in several ownership. “Almost always the enclosed lands have as centre, not a village in the usual sense of the term, but a hamlet, a handful of houses” (p. 61). Unfortunately, the author gives no clue to the amount and position of the land which is attached to each house, except in saying (without offering evidence) that he regards as comparatively modern the few cases in which a single homestead takes the place of the hamlet, and attributes this either to aggregation or to individual enclosure from the waste. There is common of pasture over the waste, but not in the closes after harvest; each man grazes his own closes, and must tether his beasts if these are unhedged. M. Bloch does not describe the rotation of crops, beyond implying that it included a fallow. Here therefore we have a culture and a cultivation very different from that of the rest of France — hedged closes instead of open fields, which are grouped round hamlets or single homesteads, not subject to common pasture. Its area covers Brittany, the neighbouring Cotentin of Normandy, Perche, Maine, part of the Orleannais, Anjou, and la Vendee, that is, the north west of France, furthest removed from Roman pressure and from the inrush of Teutonic conquest. How far the inhabitants of this area were de-celticised bv Roman and Frank, is a much disputed question; but at least it seems certain that immigrants from south-western Britain to Armorica (Brittany) in the 5th and 6th centuries either fused with an existing Celtic folk, or had again settled a Celtic population speaking a Celtic language on what had once been Celtic soil. In either case the evidence of Celtic land-settlement offered by Brittany must carry weight. In sum therefore the evidence of the more celtic parts of both Belgium and France shows a settlement by single homesteads or hamlets, the lands of which are laid out in small enclosures of several ownership. § 78 Celtic agriculture in England. For unchallenged traces of pre-Saxon agriculture in England, we have to thank the recent arresting work of Crawford, Curwen, and others, based on aerial photography and excavation. This has revealed “a field-system distinguished by small squarish fields, which is to be dated in round figures to the millennium 500 BC to 500 AD, and which is best described as the Celtic field-system.” But a millennium allows time for many changes, and it is not to be inferred that these discoveries represent what Romans and Saxons found in use. The fields usually lay on a succession of terraces along the contour of a hillside, with a marked drop (lynchet) above and below them; thev were often separated from each other by low banks of turf, so as to include an area covering from half an acre to 1½ acres; in other words, they were small enclosures, and are found on high ground, usually in connection with single huts, sometimes with hill-forts. If, as we have been assured by archaeologists, the British folk always lived on hills (in contrast to the valley-dwelling English), are we to infer that the lower lands and undulating country which form a great part of England, were unhabited till the arrival of the Romans? It seems unlikely, and I venture to suggest that the hill-dwelling habit of Britons has been overemphasised by such recent discoveries. The traces of their agriculture seem to have persisted till our time mainly because they are on comparatively poor land, now in many cases only thought fit for grazing. But, supposing a British settlement to have been made on fairly low and flattish ground, terracing lynchets would not be formed, nor needed to keep the soil from being washed down ; and the plough of the invading English, under their own field-system, would soon level out all traces of the little British fields. Nor is it easy to see how these tiny British fields, on poorish soil and high ground, could have earned the reputation of our island for wheat-growing; Britain was already recorded in the first century before Christ as a wheat-exporting country. Bedfordshire appears to offer only two areas in which we might expect to find today Celtic fields and lynchets of the Sussex-Wilts-Yorks type, namely the Dunstable Downs, and the watershed between Lea and Ouse on which Sundon and Streatley lie. On the other hand, such relics of the celtic period (the Early Iron and Romano-British Ages) as have been recorded from this county, when mapped, are found to lie either along the valleys of Ouse and Ivel and of their tributaries, or along the Icknield Way, the great highway at all periods for invaders from the east coast. At one side of the Icknield Way rise the Dunstable Downs, which yield finds of all dates; but, with this exception, traces of the British are almost invariably found along the valleys, not on the higher ground of the north or middle of the county. Devon Cornwall and Wales form the area where, if anywhere in Great Britain, we should look for clear traces of the settlements of Cymric (Brythonic) Celts. For Devon and Cornwall, the evidence is disappointingly meagre, whether this be due to the want of maps, or to the lack of local antiquarian interest. It is difficult to judge of such little evidence as Gray brought together, till the relative strength and time-periods of English penetration into different districts can be learnt and compared; for this, field-names, types of ridges, farm implements and customs, weights and measures, need study, but Gray seems hardly to have been aware of the point. Though he is not very definite on the matter, the earlier evidence seems to show that in these counties the much-subdivided parcels of land lay in blocks, certainly not in large Open Fields. For Wales there is the same difficulty; the marches and the south coast have clearly been influenced by English settlement; for the hill country, practically no detailed evidence appears as yet to be available in print. Of the Gaelic Celts of Ireland, with their offshoots to Scotland and the Isle of Man, it is now held to be probable that they did not reach Ireland through England, but as a separate people by sea from the South. Though their field-customs show a partial likeness to Cymric institutions, they need not be discussed here. The Scottish system is presumably also Gaelic, brought from Ireland by the migration which began in the third century AD; where we know it best, it has been affected by English practice. In summary, it may fairly be said that, in French and Belgian areas where a Celtic folk most successfully resisted Teutonic assimilation, there is found a type of settlement which seems to show scattered hamlets or single homesteads; their land being enclosed in small fields which (apparently) were originally grouped round the homestead, in several ownership, not subject to rights of common pasture. The pre-historic evidence from England, so far as it goes, agrees with this. In contrast, the teutonic settlement shows nuclear villages, with the land originally unenclosed in large Fields, in several ownership, but subject to common of pasture. At the end of the enquiry it is only possible to offer the vaguest suggestions to account for the peculiarities of this fragmented township. The writer confesses that, at the outset, he hoped to show Eversholt as a surviving relic of British settlement; this hope has obviously been disappointed. But if a small body of English, when settling here, had thought it better to occupy the scattered homesteads of the British than to build their conventional nuclear village, if they had kept the small enclosures round the homestead for pasture, and had laid out their usual Open Fields in such number and position as best suited the separate holdings, then the resulting picture, after centuries of slow expansion, would markedly resemble the map of Eversholt. Or again, it is possible, and such cases are on record, that British continued to live at Eversholt, alongside of English in the neighbouring villages for some time after the invasion; if they became gradually assimilated with the stronger race in agricultural practice, as they certainly did in speech and custom, this history might yield such a layout as Eversholt presented in 1764. At present, and from a single example, it is not safe to say more. 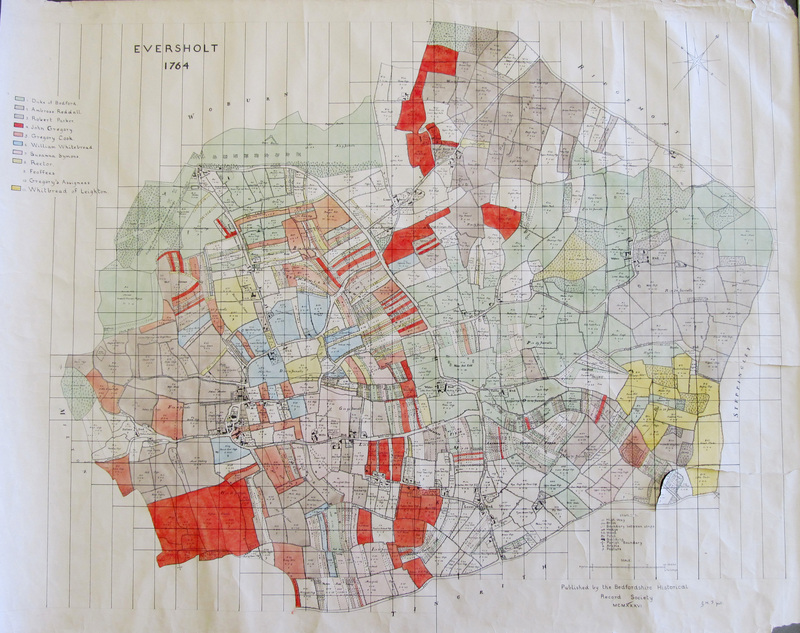 The writer hopes however that this essav may stimulate a study of similarly fragmented townships in other parts of England, which may confirm or refute his suggestions. But whatever explanation mav be offered, it must confront the fact of the unlikeness of Eversholt to the usual township of Middle England. NOTES ON THE STRIP-MAP OF HOUGHTON REGIS 1762. This beautifully drawn map was prepared for the Duke of Bedford, who then was lord of the manors, but sold them at the end of the 19th century to the Brandreth family; with the map is a most instructive Book of Reference or Field Book, of 290 foolscap pages. The map is unusually large (7 ft. 6 in. x 7 ft. 5 in.) and full of minute detail, the brooks and many of the roads have since then been diverted, and the old boundaries of the Furlongs were disregarded on Enclosure; consequently, to present such an account of Houghton, as has been given for the other four villages in this volume, would have needed many months of work which could not be spared. Only notes on the more interesting points in the rural economy are therefore offered here. Two manors are included in the present parish; Houghton Regis was ‘ancient demesne of the Crown’ under King Edward the Confessor, and continued to be royal demesne under King William I; Sewell was an independent manor before the Conquest, but was annexed by Ralf Taillebois the Sheriff between 1066 and 1086 to the royal demesne; between the two, the boundary was and is the Watling Street. As is the rule in such cases of double manors, each had its own separate field-system. Besides these two manors, the township included three ends or hamlets, Thorn, Caldecote or Carcutt, and Bidwell; from each of these a family drew its name in the 18th century. Thorn and Caldecote at least seem to be further cases (such as are gradually being noted) of little independent holdings which originally were neither manors nor members of manors; such holdings would presumably be subject to an overlord (in this case, the King), but not necessarily to a lord (in this case also the King); they were later absorbed into manors or themselves reputed to be manors. Bidwell is less clear, and was probably a mere outlier of the main village of Houghton, from which it is distant only half a mile. 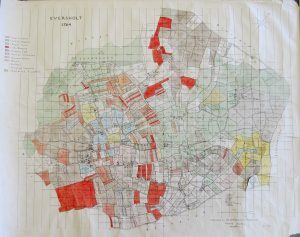 An abstract of each manor is set out in the Field Book, in which the areas are of surveyed, not nominal or reputed acres. (i). Taking these entries in order — the Enclosures, though extensive, are not unusually large for so late a date. The Innings or Every Years Land formed a unit independent of both the Common Fields and the Commons; its use is made clear by a report of 1789 as being cropped every year with no intervening fallow, generally by alternate cereal and legumen; so that, although an open field, there was no opportunity for common of pasture on it. The Innings extended from Houghton village to the Icknield Way, including in a fork the Little South Field; it also covered Dunstable Church Field. (ii). Of the Common Meadow, the Great Mead was Lammas Meadow in several ownership, but subject to common grazing after Old Lammas Day (now August 13), by which date each owner should have carried his hay. The Four Pitts, in 4 shares of 3p. The Pitt and Pin, in 2 shares of 3 and 9p. The Bliss, in 3 shares of 3, 3, and 6p. The Priest with a hole in his Head, 12p. The Plain Priest, 2 shares of 6p. The Christain Male, 2 shares of 3 and 9p. surveyed acreage, on the right their nominal acreage. The procedure was that the meadsman or some similar official brought 12 lots in a bag, omitting the King; one was drawn, and its holder or holders received for that year the first 4 poles next Tin Mead Hedge, the owner of the second lot drawn received the next 4 poles, and so on, making 48 poles in all. The 12 lots were then replaced in the bag, and each was drawn again for a further 4 poles as before, thus allotting another 48 poles. The King, reckoned as 8 poles, was added to the other 12 lots for the third drawing, which thus allotted 56 poles, bringing the total number of lots up to 152 poles. In this way every lot got a fair chance of the fat and the lean of the meadow, except the privileged King which got only fat in the broadest part. This Lott meadow yields another proof that the nominal or reputed area of strips of meadow was based on their width. Nominally, these strips added to 152 ‘poles’; measurement down the middle of the meadow on the map gives 162 linear poles of 16½ ft.; the error due to successive measurements and distortion of the parchment during repair is thus only 5%. But the surveyed area of this meadow is 16a. 1r. 7p., or 2607 superficial poles; clearly therefore the nominal poles were so styled from their width, and not from their area. The 13 lots presumably come down from a very early time, when only 13 holdings could claim common rights, though the lots have been split into shares at some later date. It is extremely likely that the privileged ‘King’ represents the share of the real King as lord of the manor; the ‘Priest with a hole in his head’ may recall the tonsure, and the ‘Plain Priest’ one or two assistants in minor orders. Curiously enough, Yarnton also has 13 lots, but here are three Lot meadows covering about 210 acres; no name of a lot is common to the two villages. (iii). While nine ‘Common Fields’ or Open Fields are named in large capitals on the map, the abstract shows that the usual three Seasons were observed by the rotation of Tilth (winter-sown crop), Breach or Etch (spring-sown crop), and Fallow. The way in which the different Fields are linked in Seasons is significant; Thorn and Caldecote, with Bury Field and How Down, are cut off from the rest of the township by a broad band of Lammas meadow and common, which stretches right across the parish and lies along the brooks. If the arable lands of this area had been merely extensions of the three great Fields in the usual way, they would presumably have been linked in the same Season with the neighbouring North and West Fields. But Thorn Comp (=campus) and the Bury Field in the extreme north- west of the parish are linked with the South Field in the extreme south-east; and I hazard the suggestion that Thorn Comp, the Stockings, and the Bury Field may partly represent the original holding of Thorn, and that Carcutt (Caldecote) Comp and How Down may partly represent the original holding of Caldecote, while these two were still independent of the manor. The other subsidiary Fields seem to be natural growths of the three main Fields. (iv). The suggestion made above (p. 25, col. 2) — that nominal or reputed acres of arable, the representatives of the medieval acres, were so reckoned from their width and not from their area, has met with some incredulity. The map of Houghton, on a scale of 26.6 in. to a mile, is so beautifully drawn as to allow of fairly close measurement; the Field Book gives the nominal acreage of each strip as well as the accurate acreage by survey; the two together should therefore yield a good test of the suggestion, and in fact strongly support it. In a Furlong which measures a furlong in length, the width of an acre-strip should of course be a chain of 66 ft. or 22 yds. ; the surveyed acreage of 14 consecutive strips in such a Furlong was 7a. 0r. 10p. 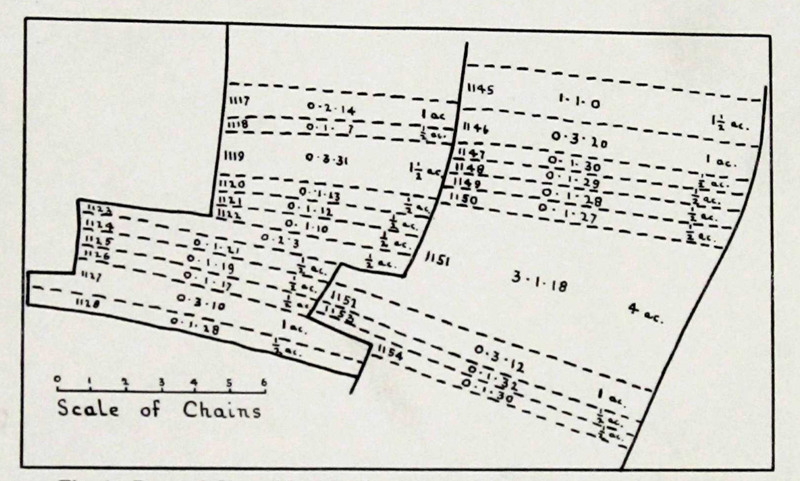 ; the nominal acreage was 7½ acres, and the total width of the strips measured on the map at right angles to their longer axes was 7 chains or the width of 7 acres; these all tally as closely as can be expected. But for a real test, strips of irregular length are needed, such as were traced for fig. 4. Numbers 1117 to 1128 were entered as 8 nominal acres, their total width at right angles to their longer axes was 8 chains, that is the total width of 8 statute acres a furlong in length , but they contained only 5a. 2r. 24p. by survey. Again, numbers 1145 to 1154, reckoned as 10½ nominal acres, had a total width of 10½ chains, the width of 10½ acres ; but were shown by survey to contain only 8a. 3r. 26p. Clearly these were all strips of acre-width, but contained much less than a statute acre in area. This result, which I have tested on maps less accurately drawn, should mean reconsideration of much which has been written on early agriculture. (v). The Commons for pasture were of varying use and period. (1) The Cow Commons included (a) three Greens in that band of meadow and pasture along the brooks, which has been said above to separate Thorn and Caldecote from the rest of the township, (b) “Besides the above three Commons, which are alway Unvariable, the following changable Commons are Cow Commons when the Fields to which they belong are in their Tilth or Breach Seasons, Vizt.,” two parcels in the South Field Season which offered 26a. 1r. 7p., four in the North Field Season amounting to 23a. 3r. 3op., and two in the West Field Season measuring 35a. 2r. 11p. A pencil note adds that each Field was Sheep Common in its Fallow Season. A page headed ‘Stint’ of the number of beasts allowed to each common right has not been filled up. (2) Sheep Commons were furnished by Greens and the verges of highways at Houghton (13a. 3r. 15p.) and Bidwell (6a. 1r. 8p. ), by a considerable common further down the brook on which South Mead lies (25a. 3r. 23p. ), and by the waste verges of the Watling St. (30a. 3r. 5p). These 76a. 3r. 11p. were ‘unchangeable,’ that is, were independent of the Seasons of the Open Fields. “Besides the above which are always Unvariable, all the changeable Commons in the Common Fields are Sheep Commons, when the Several Fields are cleared, until Lady Day, and the Fallow Fields untill the Lady Day following.” (3). There were also Intercommons. The right of Intercommoning with another parish is a survival from the days when a ‘parish’ had not yet become a geographical area nor its boundaries determined. There were intercommons with Caddington on 1a. 1r. 21p. of Zouches Downs; along the whole length of the bound-ways on the E., N., and N.W. sides of Houghton, reaching from Icknield Way to the Watling St., shared presumably with Leagrave, Toddington, and Chalgrave; also, rather surprisingly, on 10a. 2r. 5p. of greens and verges, lying round two sides of the Bury Field and penetrating far into Houghton, on which presumably Chalgrave had a claim. The total acreage of intercommon was 28a. 1r. i4p. Figure 5. Putative reconstruction of early field layout.